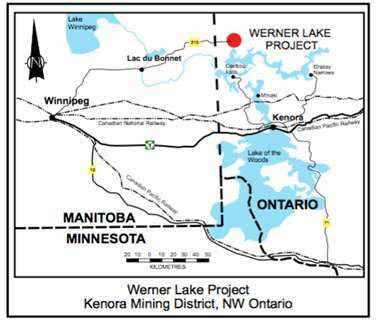 The Werner Lake property is located in north-western Ontario, within the Kenora Mining District approximately 85 km north-northwest of Kenora, Ontario and approximately 170 km east-northeast of Winnipeg, Manitoba. 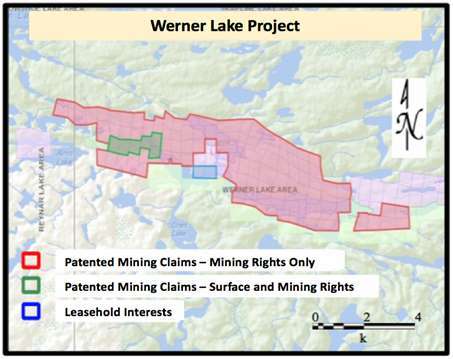 Currently the Werner Lake property consists of 102 Patented Mining claims conveying mineral rights, 6 Patented Mining claims conveying mineral and surface rights and 2 Leaseholds. 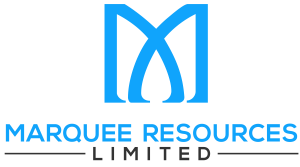 This group of Patented Mining claims and Leaseholds covers approximately 1,746.4 ha. 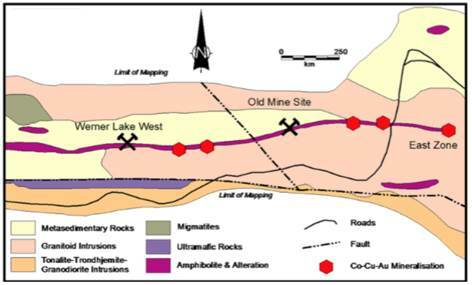 The Project area is underlain by a complex sequence of east-west striking, steeply dipping sequences comprised of metasedimentary gneiss, granitic gneiss, mafic to ultramafic rocks, alteration rocks, and massive Co-Cu-Au mineralisation plus granitoid intrusive rocks.